The theme is cameos, cameos, cameos! Sub-themes include, but are not limited to: musical numbers, getting the band together, and magical realism. 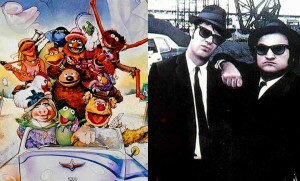 Revisiting “The Muppet Movie” and “Blues Brothers” and focusing on every recognizable celebrity after a lifetime of movie-watching–and probably still not getting everyone–is an exercise that each one of us loved. Not only that, these flicks are entertaining, joyous romps. A Muppet origin story and an SNL-based film with a killer soundtrack–what is not to love about that pairing? But brace yourselves, because this next pick is going to be awesome, super weird, or just awkward.